Krystle Daniels-Felix will be a force to be reckoned with in 2014. Professionally, she is a passionate teacher who inspires her students to work hard and to never give up. Artistically, she is an entrepreneur who turned her love for photography into a profitable business. 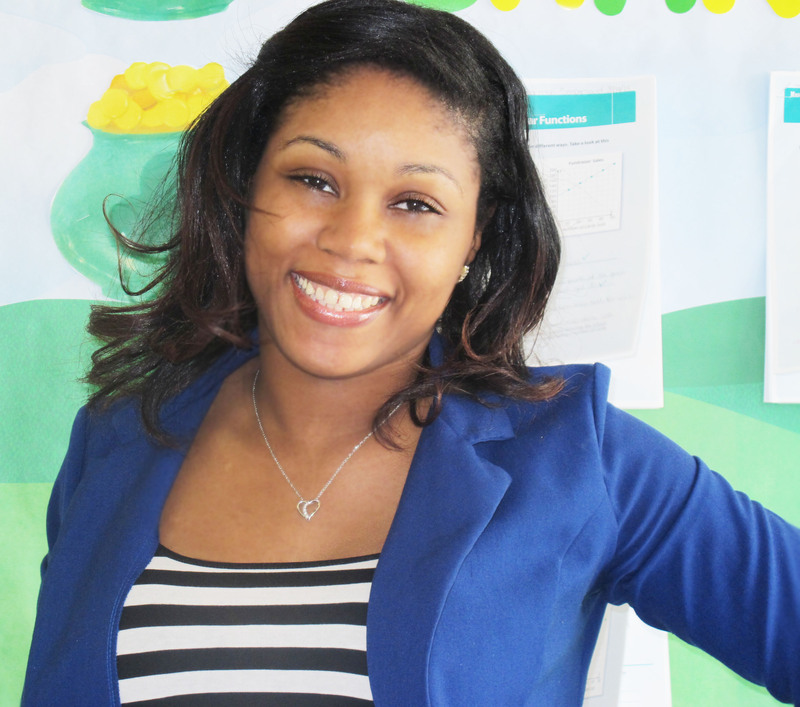 This millennial understands that teachers play a valuable role in our society – a role that she takes very seriously. Krystle’s creativity and zeal for the art of photography, along with her desire to touch and shape our future, serves as a reminder that in order to live a life full of joy, you must do things from the heart. Miss Daniels-Felix is going to rule the world. Lindsey Christie (LC): Miss Millennia Magazine would like to thank you for taking the time to share your story with our readers. With the deteriorating state of the American education system today, it is refreshing to know that you are not just a teacher who teaches out of a book, but also a teacher who teaches from the heart. Krystle Daniels-Felix (KDF): Thank you for having me. 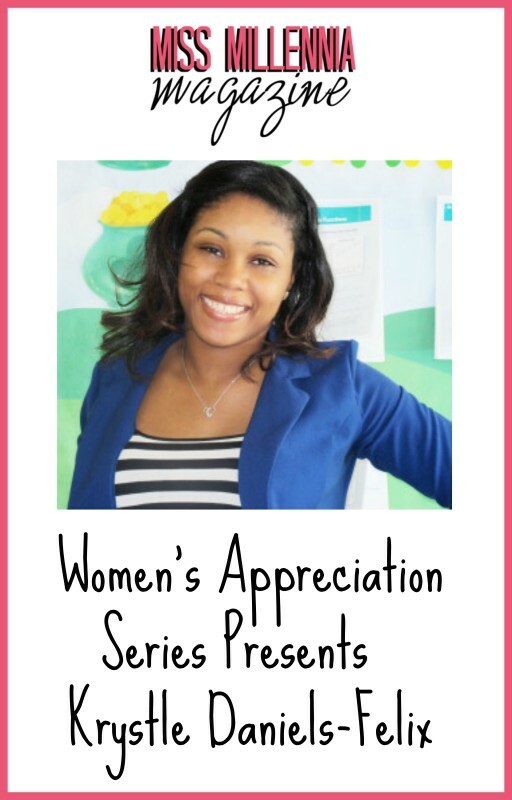 I am very honored to be featured in the Women’s Appreciation Series! I am very passionate about my role as a teacher. Christian educator Henrietta Cornelia Mears once said that “you teach little by what you say; you teach the most by what you are.” I live by that quote. I want my life and what I do to serve as examples for my students. I feel such a reward in advancing my students to higher levels. My goal is to not only advance them academically, but also socially, and emotionally. LC: Did you always want to be a teacher? KDF: You know, it’s so weird. When I was in high school, my aspirations were to become an Accountant. However, when I went away to college, my focus began to change. Though I liked math, I decided that I didn’t want a career where I crunched numbers all day (laughs). I attended Rider University, and graduated with a Bachelor of Science in Business Management. Little did I know, I was sowing the seeds to eventually become a business owner. My mother has her own business, and my late grandmother had various businesses, so the inspiration was always there. However, at that time, I didn’t have a vision for owning my own business. When I graduated from Rider, like all college graduates, I needed a job! I needed something in place until I found my “dream job.” I ended up getting a job at a local church as an After-school Program Coordinator. In my mind, the position was only temporary because I was looking for a job in Corporate America. At the church, I was responsible for managing the after-school tutoring program, along with other extra-curricular activities. It’s funny how life works out sometimes; it never goes according to your plans. Working there solidified my desire to become a teacher. While in that position, I realized that I enjoyed working with kids. Children are full of so much promise. I enjoyed mentoring them, and watching them learn new things. Shortly after, I decided to attend Touro University to pursue a Master of Science in Education. A year after completing my first Master degree, I returned to school for a Master of Science in Instructional Technology. LC: Talk about ambition! That is so awesome. Congratulations on your academic success. So, you have two Master degrees? KDF: Thank you. Yes, I have two Master degrees. LC: From what I have been reading, these are exciting times for public school teachers. There are new technologies, and so many new approaches to teaching and learning. However, I have also read that these are also difficult times. In our public education system, especially here in New York City, there are large conflicting expectations of teachers. Teachers have limited educational resources; because of budget cuts, they have limited autonomy, and little opportunities for growth and advancement. With the seemingly bad outweighing the good, how do you cope? KDF: My main focus is on my students. I block out all of the negativity, and focus my attention on the mission that I have at hand. I teach at I.S. 392; a middle school for the gifted and talented, located in Brooklyn, New York. My students are incredibly bright. I teach my students that where they come from does not determine where they can go. Each and every one of them has the potential to become something great. Teaching can sometimes be emotionally draining, especially when you have so many things working against you. But I find so much reward in teaching. We have to sow the seeds of success in our youth from now. I enjoy building their confidence. I teach my students that with hard work, there is nothing that they can’t achieve. I have a son. Sometimes I find myself staring at him wondering what will his favorite subject be when he goes to school. He just turned two, so it obviously too early to tell (laughs). He is very smart for two years old. His vocabulary is increasing daily, and he loves when I read to him. I want my son’s future teachers to stimulate and challenge him. The same goes for my students’ parents. When they drop their children off at school in the morning, they expect me to stimulate and challenge their kids. I have an important job; a job that I take very seriously. LC: What methods do you implement in the classroom? KDF: I use differentiated instruction in the classroom. This teaching style allows me to address the different learning styles that I have in my classroom. It also allows me to teach beyond the core curriculum. Children must be acquainted with modern day technology. Email, drop box, and Google drive, are some of the tools I use for instruction [in] my classroom. Technology is changing the world. I want to make sure that I do my part in preparing my students to meet the challenges of this new world. LC: What subject do you teach or is your favorite subject to teach? KDF: Well since I am a Special Education Teacher, I currently teach all subjects. But I will say that math is my favorite subject to teach. LC: What would you be doing if you weren’t a teacher? KDF: Honestly, if I wasn’t a teacher, I would be a photographer fulltime. It’s funny because photography is something that I picked up as a hobby at first. LC: Speaking of your photography business, I know you are a self-trained photographer. Can you tell me a little bit about your photography studio? KDF: My studio, Kryssy Image Ðesigñs, provides in-studio and on-location photography services for weddings, engagements, maternity, and other social events. I specialize in delivering professional, creative, sophisticated, innovative and exciting images to meet the needs of any event or gathering. Although my studio is located in Brooklyn, NY, I serve the entire Tri-State Metropolitan Area. My husband, who is my biggest supporter, is also my business partner. My husband and I work together to capture just the right lighting, mood, and personalities of our customers. I also design and create invitations and custom save the dates for all types of events. LC: How hard was it to start your own business? Did you ever have any doubts about what you were doing? Did you ever think it wasn’t going to work out? KDF: I will start by saying that starting a business is similar to being in a marriage. It takes commitment, desire, and passion. My mother has a successful pastry catering business, so I was able to learn a lot from her. She helped me create a successful business plan, and showed me how to incorporate my business. I greatly appreciated her help and support. My husband and I worked together on advertising, designing the company logo, and building the company website. In the beginning it was hard to balance my full-time job as a teacher with my commitments to my family. It took some getting used to, but I was able to find a way to make it all work. My family, of course, comes first and everything else after. My husband has been very supportive by stepping in when necessary to assist with house chores, and the demands of my son. I’ve never doubted my business. To me, I don’t consider it to be work; I get lost in time editing images and the satisfaction people get when they see their portraits gives me the zeal to keep going. LC: What advice can you give women who want to start their own business? KDF: Uncover your passion and really understand and know why you want to start your own business. You will need that to pull you through when things get a little rough. Having patience and courage is a must, because it will get tough in the beginning. You WILL encounter bumps along the journey but perseverance will push through. LC: What do you think the key to success is? KDF: For me, patience and perseverance are the keys to success. There were many times that I wanted to give up, but I enjoyed photography, and really wanted to succeed at it. LC: How was your personal journey in starting your own business? KDF: Again, it took patience and faith. Building a portfolio, allowing people to view your work, learning to accept constructive criticism, and balancing other demands in life has been a long road leading to a destination of success. LC: What propelled you to start your own business? KDF: I started off creating flyers, brochures, and invitations, for my company events, and also for my sorority events. I always enjoyed taking photos, and editing videos. My Mom noticed how good I was at it, and pointed out that I should go into business for myself. LC: What are the dos and don’ts of managing a business? KDF: First off, don’t give up easily! Like I said, starting a business is tough, but stick it through. Be patient with yourself and remember that starting a business is a process. Also, try to associate yourself with people in the same field. Don’t be afraid to ask lots of questions! My mother always told me that “a closed mouth never gets fed!” Most importantly, be prepared for some disappointments, because not everything is going to go according to your plans. LC: Well thank you for allowing us to interview you Krystle. We applaud you for shaping our future and making a difference in the lives of our youth. You are truly an inspiration to our readers, and it is an honor to feature you. 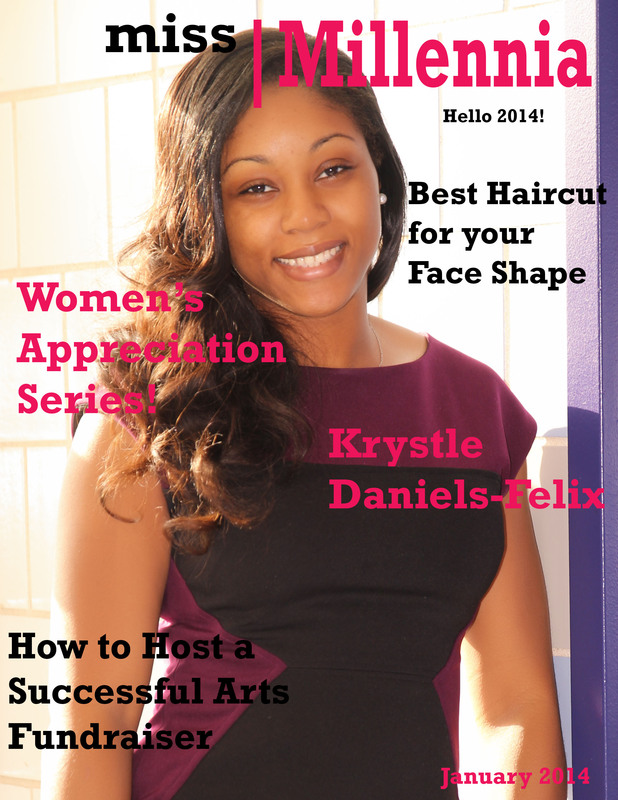 Miss Millennia Magazine wishes nothing but the best for Kryssy Image Ðesigñs. KDF: Thank you for featuring me. It was a pleasure. Krystle is a talented young woman. I am proud and excited for her success. It is wonderful to see women making waves in history. Wow … great article! Very insightful and uplifting. Keep up the good work Krystle. Mrs. Daniels-Felix is a remarkable and inspiring individual. This article encompasses all of her attributes and ambitious attitude. Her success is an inspiration to us all! Wow!!! This is a great feature on such a talented, motivated young woman. Krystle’s accomplishments are truly an inspiration & I wish her much continued success on her future endeavors, great job!!! Krystle is an awesome young lady. I am proud to call her my Sorority Sister and I expect nothing but great things in her future. Kudos Millennia on an excellent feature. Krystle you are an inspiration to many people. Keep up the good work!! Great jo! Proud of all Krystle accomplishments. Best wishes for all your future endeavors! This is a wonderful article that sheds light on the amazing work that everyday people do to make an impact on their community! Keep up the great work Krystle!!! Krystle you are very inspirational in every sense of the word. I am proud of your success and can’t wait to see your future accomplishments. Great article. I’ve had the chance to meet Mrs. Daniels-Felix as a track coach and not a teacher . Her overall personality and motive was so different to me . I saw her as not only my coach but one of my teachers . She didn’t physically teach me academics but she has taught me about life and its different aspects. She is one of the many who contributed strongly in leading me to where I am now in high school . It is truly inspiring to see her featured beyond our school environment and in a magazine .